Peace was brief after the first round of attacks on 15 September. At 1.45pm, the coastal radars picked up the first signals of a returning force. In all, there were 114 bombers, with 361 fighter planes to guard them. The Luftwaffe planes were heading in tight battle formation to London, and the docks were their target. The ferocity of the British fighter attacks produced two mid-air collisions: accidental, but the apparent fanaticism of their opponents was enough to traumatise the German bomber crews who were witnesses, and prove the morale of the British fighters. Whilst they couldn’t prevent over 100 bombers voiding their artillery, their efforts and the heavy cloud cover severely compromised the bombers’ accuracy. The docks were spared, but the crowded terraces of West Ham suffered sorely – going against Hitler’s specific instructions not to bomb civilian residences. 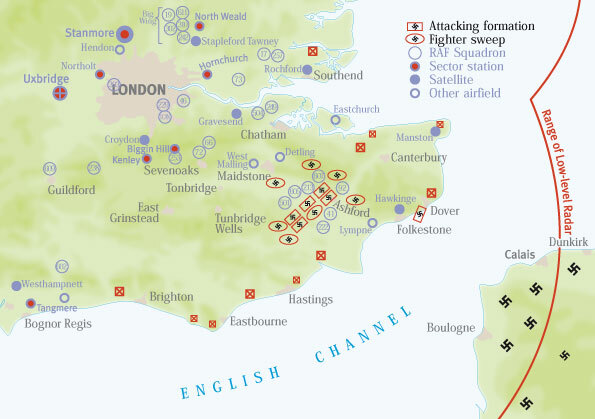 The RAF lost 28 planes to the Luftwaffe’s 58. Most importantly, Fighter Command’s determination and bravery had seemingly quashed the notion that the force was at breaking point. Operation Sealion was permanently postponed.